Ace Cafe London, having originally opened in 1938, teams up with Western Star Records to celebrate the 80th anniversary of the famous North London venue with an especially put together double CD album, to be launched at and available from the Ace on Sunday 8th April ! 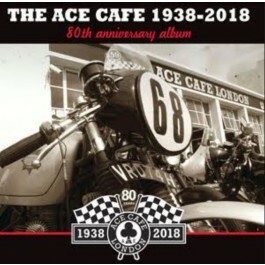 The Ace Cafe 1938-2018 80th anniversary double CD album, with its 46 rock n’ roll tracks focused on bikes and cars, and an enclosed 8 page copiously illustrated booklet, embodies the style and culture of Ace Cafe London and showcases the spirit that has endured through the ups and downs of this iconic British landmark. Featuring an array of British bands and artists, the tracks are rebellious, wild and frantic, much like the cultural shift in Britain that the Ace experienced from opening, throughout the ’50s and ’60s, and to date. This unique and very special double CD album reveals the Ace and the soundtrack of the Ton Up era and subsequent Rocker culture!